With additional transmission infrastructure now in place, enXco Inc. recently completed work on Minnesota's largest windfarm project, the $385 million, 205-megawatt Fenton wind farm in the Buffalo Ridge area of the state. When it comes to the relationship between transmission infrastructure and wind farms, it can be a case of if you build it, they will come. Building additional transmission infrastructure had a great deal to do with the recent development of the Fenton wind energy project in the Buffalo Ridge area of Minnesota. Utility company Xcel Energy invested some $160 million to build new transmission lines and substations to Buffalo Ridge-and enXco Inc. and its partners decided to go ahead with the $385 million, 205-megawatt Fenton wind farm, the largest in the state. "The transmission infrastructure was the major piece in going ahead with the Fenton project," explained Ian Krygowski, senior project developer for enXco. "We selected an area for the Fenton project at Buffalo Ridge based on their preliminary transmission routing." Buffalo Ridge, in southwestern Minnesota and running into South Dakota, possesses some attractive features for wind generated energy. About 60 miles long, the ridge has the second-highest point in Minnesota, with an elevation of 1,995 feet. The rolling hills that are created with its topography help to develop a high average wind speed, ready for capture by Fenton's 137 GE 1.5 MW turbines. enXco also knows the territory-it built the 85.5 MW Chanarambie project at Buffalo Ridge in 2003. "Buffalo Ridge is well known as the premiere wind resource in the state of Minnesota," says Krygowski. "We actually started to do the first wind monitoring in the area in 1998. It's been identified for about nine years and been under active development for eight years. Essentially, blocks of wind energy have been developed at Buffalo Ridge as upgrades to the transmission system are completed." The rolling hills of Minnesota's Buffalo Ridge help to develop a high average wind speed, ready for capture by Fenton's 137 GE 1.5 MW turbines. The original development plan called for bringing the Fenton project forward shortly after Chanarambie was completed-but the expiry of Production Tax Credits at the end of 2003 meant a re-scheduling. Construction of the project started in 2006. The approvals process for wind farm projects in Minnesota is both fairly straightforward and well developed, says Krygowski. Minnesota has had plenty of experience with wind power. With total installed capacity of 895 MW, it stands at Number 4 in wind energy installed in the U.S., just behind Iowa's 936 MW. "It's a fairly comprehensive process, and one that we're familiar with and comfortable with," says Krygowski, adding that enXco also has its regional office in Minnesota. "We really didn't run into any issues that we could not address or accommodate." Indian remnants found on the northern part of the Fenton site meant some tower re-siting. enXco worked with the state's Department of Natural Resources, and the Public Utilities Commission and the state Department of Commerce, which oversees the permitting, to ensure the final sites were acceptable. When enXco maps out potential turbine sites on a wind farm, a geotechnical analysis is done at each site; the company anticipates that some sites, about 10 percent, will not be acceptable, usually due to sub-soil conditions not being sufficiently strong enough to support a turbine. So they always have a number of alternative locations already identified. "There was not any problem in re-siting the turbines-it's not like there was any scramble to find alternative turbine locations," says Krygowski. "We're prepared for that. We kind of have our "A" team of sites, and then our alternative locations, and the alternative sites are modeled along with the rest of the layout." The alternative sites are still good sites-they might just be a bit further away from the other turbines, so a longer electrical collector system would be required. "It's not like they are bad locations from a wind standpoint-there's no meaningful change to energy production." An interesting challenge the Fenton project faced, and which other wind farm projects might be mindful of depending on their locations, involved dealing with the FederalAviation Administration on possible effects of the wind turbines on Homeland Security radar installations. Depending on the type of radar system being used, the radar might pick up the spinning blades of a turbine. "This was an issue the Department of Homeland Security was just identifying, and initially it was a little nerve-racking for a number of wind farm developers caught up in this, including us," says Krygowksi. "But the Homeland Security people were very pro-active, and it was not a matter of them laying down a blanket rule saying we could not build anything. "They were working to understand what the impacts were and to mitigate them. They were very good at addressing issues with the wind projects that were in late stages of development." Krygowski adds that he felt there was good dialogue between the industry and Homeland Security, with the FAA staff being good facilitators. "Some solid guidelines have come out since then," he adds. "I think there are questions that still have to be answered in terms of wind farms and radar and how it is all going to work. But for the most part, it seems like we have good rules of thumb now and everyone is aware of the issue, so it won't surprise anyone again." The original plan for the Fenton project was to start construction in the summer of 2006, with roads, turbine foundations and electrical infrastructure complete by the fall, and the turbines erected in May 2007. But it took until early fall to get all the possible issues related to the radar worked out, and that pushed the construction start until late September. That said, their contractor, M A Mortenson, was still able to get in and build access roads to 133 of the 137 turbine sites, and put foundations in place for those 133 sites by this past December. By then, it was too cold for any additional concrete or dirt work, so Mortenson erected turbines through the winter. On the construction side, enXco usually hires a single engineering, procurement and construction (EPC) contractor for each project. enXco has used M. A. Mortenson of Minneapolis as contractor on a number of wind farm projects, including the Fenton wind farm. "There were two reasons for that," explains Krygowski. "The turbines were delivered through late December and the winter, and we were not able to find a good place to store the controllers and some of the other sensitive components over the winter that was close to the site. "So we decided to put up the base sections and mid sections, cap those, and it was perfect protection for that equipment. But then we decided to go ahead with full erection through the winter, which worked very well for us. We had excellent weather all winter long. By the time the thaw started, and we had to stop work, 79 of the 137 turbines were fully erected." Excellent weather in this case meant very cold temperatures, but relatively little snow. This made the crane traveling required for turbine erection quite easy, and the frozen ground minimized compaction to the farm fields. Most of the Fenton wind farm is on either croplands or pasturelands. "For the most part, it's open land," says Krygowski. "There are vast expanses of open land, gently rolling, that are well exposed to the wind. And there is a good system of state and country roads, so getting around and transportation of materials has not been a problem at all." Power connection was to Northern States Power transmission lines (part of the Xcel Group) and was done through regional transmission organization Midwest Independent Transmission System Operator. In a lot of ways, Minnesota is a microcosm of what is going on in states that are looking to move ahead in renewable energy. Regulatory mandates essentially requiring that 25 percent of the power generated in the state comes from renewable sources by 2025 are a major driver for wind power in the state. That means that upwards of 6,000 MW of wind power will have to be in service by 2025. "That's a huge increase, but Minnesota has the wind resource to support these mandates and much more," says Ian Krygowski, a senior project developer for enXco who works out of the company's Minneapolis office. The state now relies to a large degree on coal and nuclear generated power, but Krygowski notes there appears to be strong support for renewable power in Minnesota. "People see it as a way for us to make use of a resource without affecting the environment. With enXco's Fenton project, it involved using less than two percent of the land base for roads and turbine sites. The farmers can still farm almost all that land." While the Fenton project, at 205 MW, is large-and the industry is likely to see many more of these in the future-Krygowski notes that there is room for small and medium-sized wind energy projects, as well. "With the larger projects, there are going to have to be major improvements to the transmission systems, such as with Buffalo Ridge. But smaller wind projects may be able find a spot where upgrades to the transmission system are relatively minor. So there will be room for large projects and smaller projects." Celebrating its 20th anniversary this year, enXco could be considered an old hand-in a fairly young industry-at developing and constructing wind farms. "We have a pretty well established framework that we try to implement for each of our projects," says Krygowksi. "But every project has its unique challenges-some of them you can't plan for, like the radar situation with the Fenton project. We have a large pipeline of projects and we try to ferret out as many of those potential surprises as possible." On the construction side, they usually hire a single engineering, procurement and construction (EPC) contractor for each project. 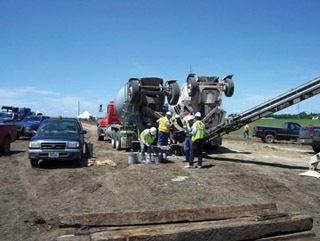 enXco has used M A Mortenson of Minneapolis as contractor on a number of wind farm projects. enXco will have an onsite representative that oversees quality control on a project, as well as handling landowner relations. 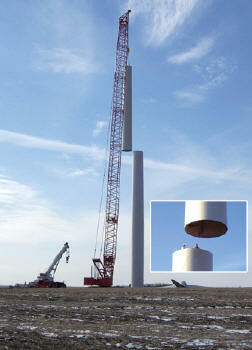 In addition to developing and building the Fenton project, enXco will also be operating and maintaining the wind farm. The company is among the largest third-party wind projects O and M's in the United States. "We take projects from greenfield right through to eventually decommissioning, and all the steps in between. We run turbines for a lot of different owners." Throughout the construction process, the company's director of technical services has monthly project reviews with the contractor and suppliers. And as they move from construction phase to the operations phase, enXco will bring its operations and asset management people in. "We start to include them within six months of going commercial so they understand the history of issues if resolution goes beyond the construction phase. They'll have a good familiarity with the project and what the issues are." Krygowski notes that enXco actually has its roots in O and M and asset management. The company only started doing development work in the mid-1990s. "When we talk about enXco being a wind company, we have a lot of experience-we've been doing it for a long time." That history and depth helps the company, since enXco, like other major wind farm developers, is extremely busy these days, and continues to expand, which means additional staffing. "For people who are interested in renewables and especially wind power, enXco has a good track record, and I think that helps in attracting good members to our team." Along with the growth of the industry has come change and growth on the supplier side, Krygowksi adds. Major suppliers have grown through takeovers, and new suppliers from Europe are entering the fast growing U.S. market. That's good for the industry, he says, as it fosters innovation. "A lot of what is driving the advances in wind energy equipment is competition among the manufacturers to create a product that deals with the unique challenges of wind, such as it being intermittent," notes Krygowski. With things well in place with the Fenton project, Krygowski and his colleagues are now focused on 2008 projects. They're working hard to get projects done before the expiry of federal tax credits. "There is a big push on to make sure we can install a couple more wind projects before that tax credit goes away on us again."